Wow! Summer’s here, schools out and vacation schedules full. We all need to make sure we are extra dilgent watching out for bike riders, motorcyclists and children playing. This newsletter includes articles providing summer health tips.. Also what would “The Insider” be without a healthy recipe?! The new Corporate Office is just about finished and ready for occupation. We are extremely excited and pleased how the project has progressed., We will soon be expanding the yard by taking down the hillside. Once that is complete, we should have enough room for our units to turn around and will no longer back across Washington Street. 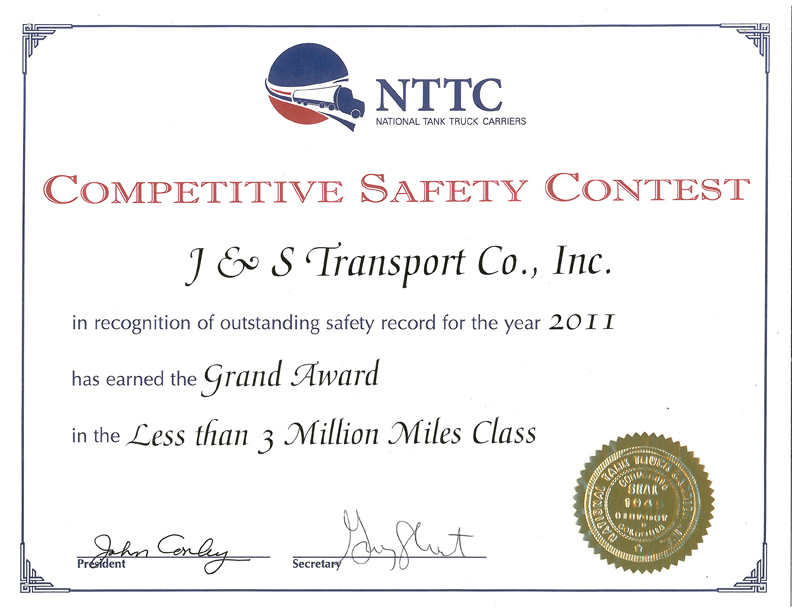 Safety Steve has been busy promoting safety while bringing J & S Transport to center stage as the leader in Safety for our Industry. He renewed his accreditation as a Certified Director of Safety (CDS) with the North American Transportation Management Institute.. Steve had to submit a portfolio to the Accreditation Board for review and approval. Safety Steve was elected Chairman of the National Tank Truck Carrier Association Safety and Security Council, East Region during a meeting in Denver, CO this past June. 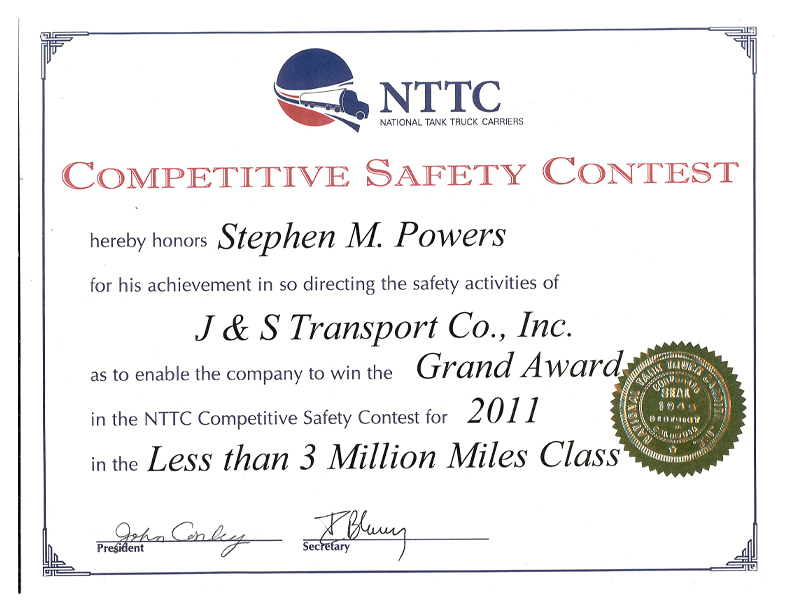 Steve was also made Chairman, Massachusetts Truck Driving Championship Committee for 2014. Amanda Hamel graduated from Salem State University receiving her Bachelor of Science Degree in Business, with a concentration in Accounting. Amanda is now setting her sights on Graduate School.. Will we soon have an MBA’er in our midst?! ➢ Wear sunscreen that has an SPF of at least 15. Make sure children are also adequately protected. Researchers in Oxford, England have released a study showing high doses of ibuprofen or similar painkillers (non-steroidal anti inflammatory drugs) where a daily dose of 2,400 milligrams increased the risk of heart attack, stroke or death by one-third. This type of painkiller was also associated with double the risk of heart failure and a higher chance of gastrointestinal complications such as ulcers. These researchers noted that the risk was higher among people with underlying risk factors, such as elevated blood pressure or cholesterol. They suggest people talk with their primary care physicians before taking these medications. In a large, nonstick frying pan, heat the olive oil over medium heat. Add the onions and mushrooms and saute until tender, about 5 minutes. Stir in the white beans, garlic, basil and grilled chicken strips. Keep warm.